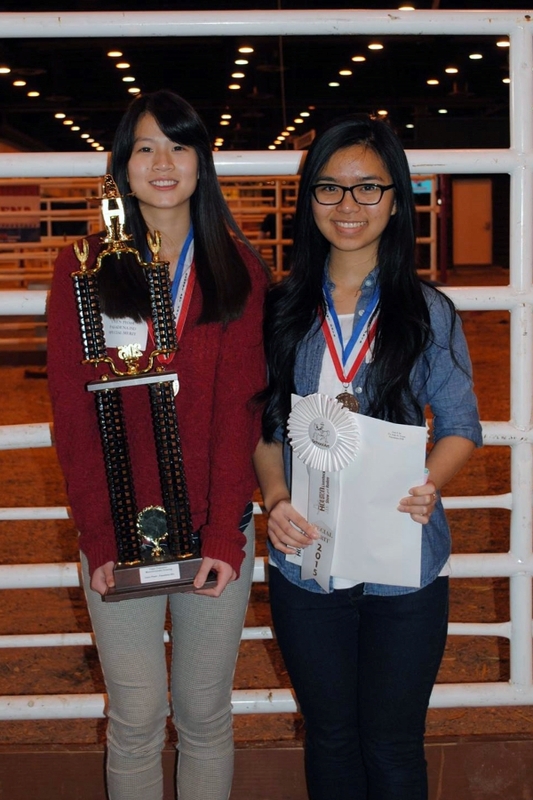 In rodeo terms, Sam Rayburn High School ‘roped’ a historical win this weekend at the Houston Livestock Show & Rodeo school art competition. For the first time in the program’s more than 50 year history, the Grand Champion winner and Reserve Grand Champion were from the same school. The two record-breaking students are Sam Rayburn seniors, Raina Baggerly and Vanessa Sosa. Baggerly won Grand Champion and Sosa won Reserve Grand Champion. In addition to Baggerly and Sosa, Sam Rayburn also boasts a win with Patricia Ontiveros as Class Champion in Color Drawing and Denisse Molina as Reserve Class Champion in Painting. Dobie High School also claims a win with Uyen Pham as Class Champion in Monochromatic Drawing. Overall, Pasadena ISD students took five out of the ten top awards at the HLSR School Art Competition. Several students also qualified for auction lots for the 2015 HLSR School Art Auction this Sunday, March 15, at NRG Arena. These student artists will sell their artwork to the highest bidder to compete for scholarships. Dobie High School students Uyen Pham, Class Champion in Monochromatic Drawing and Tu Ahn who took a coveted auction lot.